Firstly it looks like we have run out of options in the Grassmarket. The shop next to Espionage is not available so that really is that. Obviously we can now cast our net wider and more importantly find somewhere that is rates free. I have been offered a shop but I’m still open to any ideas that are put to me this week. As for the City Art Centre and the idea of somwhere showcasing the history of Scottish music that has been an incredibly popular idea. It was suggested the best way forward was to ask for a trial to show what could be done but so far I am yet to get a reply. 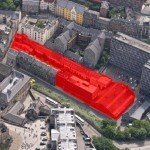 My understanding with the King’s Stables Road site is that the council will make a decision in the middle of February. Once all the final submissions are in this month I should be able to say more about what is proposed at least by the developer I have been speaking to. It is hard to gauge what other things are on offer for the site as despite the council saying consulting with the community was of great importance I’m led to understand that no other developer has been in touch. So at least our ideas are attached to a developer’s bid that involves a sizeable arts and community element and has involved consultation with others in the area. Anything than that I can’t really say but hopefully more soon. There is so much that could be done to promote Scottish music and one thing that became clear talking to Creative Scotland and the SMIA is that promoting Scotland on a regular basis is not their job ! Certainly industry events will be attended but the day to day grind of promoting Scotland’s artists that is not for them. More emphasis also seems to be placed on “international” profile than simply being known in the rest of the UK. Oddly this is mirrored with business organisations all more interested in export than any consolidation at home. Anyway I sent them my ideas and will make them public soon once I have had their comments. This has all dragged on far longer than I expected and even the King’s Stables Road site was meant to be decided on by Christmas. I’ll be very disappointed if everything now isn’t settled within the month.